Disney Cruise Line - "Disney Dream"
The most prominent new feature on the Disney Dream is the AquaDuck Water Coaster: an impressive sight on the ship's upper decks. The AquaDuck water coaster has turns, drops, an uphill section, and river rapids: riders zoom along in two-person rubber rafts. The ride extends for 765 feet, starting on Deck 16 with a drop and then a swing-out loop that extends 13 feet beyond the side of the ship, 150 feet above the ocean below. Read details of all the drops, twists, and turns of the AquaDuck water coaster, ending with a splashdown on Deck 12. Kids must be 48 inches tall to ride the AquaDuck! Photo courtesy of Disney Cruise Line. Neat idea! And an industry "first", on the Disney Dream. The inner cabin pictured above is transformed by a high-tech "Virtual Porthole" that displays a real-time view of the sea outside the ship. High-definition cameras feed live video to each Virtual Porthole. Fancy technology ensures that, for each cabin, that Porthole's view is consistent with the motion felt in that part of the ship. Guests might also see an animated character visit at the window: such as Peach the starfish, above, a character from the "Finding Nemo" movie. Like the Disney Wonder and Disney Magic (which each have a nursery called Flounder's Reef), the Disney Dream cruise ship has a nursery for infants and tots age 3 months to 3 years. Parents can check on their kids through one-way window into the nursery's main play area. The nursery has a naptime area too. As with Flounder's Reef nursery, parents will need to book in advance for the nursery and pay an extra charge. (Other kids programs are all-included in the cruise.) On the plus side, kids under three sail free on Disney cruises. Kids age 3 to 10 can have fun at the Oceaneer Club, on the Disney Dream. Above is a central hub area with a Peter Pan "Never Land" theme: a place for storytelling, Disney character meet'n'greets, and for performances starring -- the kids themselves. Also in this area is a giant screen, for watching movies and for interacting with Crush the Turtle. Using similar technology, Crush will also make appearances on the giant screen in the Never Land area of the Oceaneer Club, on the Disney Dream ship. Andy's Room, familiar to kids from the Toy Story movies, offers places to climb; computers integrated into the walls, for games; costumes and props for make-believe. In this themed play area -- depicting the forest home of Tinkerbell and fairy friends-- kids can make crafts or play dress-up. Other play areas in the Oceaneer Club are Explorer Pod, with a submarine surfacing in the center of the room, and computer game stations; and Monster's Academy, with play structure for climbing, computers integrated into the walls for games, and monster costumes and props. The Oceaneer Club also has an Animator's Studio, and a Sound Studio with song-making and recording software. The two Workshops, meanwhile, are used for hands-on fun, such as science labs, art projects, or trying out some culinary skills. On Deck 5 of the Disney Dream, teens age 14 to 17 have 9000 sq. feet of their own indoor and outdoor space. A "teen-only" swipe card gets them into an area with fountain bar, cushy chairs, media room... Kids can try out video editing technology, social media apps, WiFi laptops, and lots more. The Vibe teen club -- for ages 14 to 17-- extends to an outdoor area, with lounge chairs, wading pools, water fountains and jets, and games such as foosball and ping-pong. Meanwhile, kids age 11 to 13 can hang out at the Edge lounge, a loft-type space with notebook computers for games and social media; massive video wall for gaming or movies (used as one giant screen, or smaller screens); a lighted dance floor; and view of the AquaDuck water coaster as it passes through the forward funnel of the ship where the Edge is located. Click the photo above to see a larger image: a 5-foot tall bronze statue of Admiral Donald Duck will survey this three-deck lobby, from the base of the grand staircase. The Enchanted Garden Restaurant, shown above, is styled as an airy conservatory, with a "sky" that transforms from day to sunset to night-time, while guests dine. For other family dining choices: those who've sailed on the Disney Magic or Wonder will be happy to find a recurrence of the Animator's Palate, a signature restaurant decorated with black-and-white sketches that turn into color during the course of the meal. The Royal Palace restaurant, meanwhile, is inspired by classic Disney movies like Cinderella, Snow White, and Sleeping Beauty. Read more about the restaurants on the Disney Dream. Where will the family sleep, during the cruise? Guests on the Disney Dream have a range of choices, from 898 sq. ft. of space in a "Royal Suite with Verandah", to Standard Inside Staterooms with 169 sq. feet. Remember that these inside staterooms have virtual portholes, which transform the experience of an inside cabin; they can sleep three to four people, with a queen-size bed, a converible sofa, a privacy divider and (in some units) a pull down bed. Several types of cabins on the Disney Dream cruise ship can sleep a family of five. 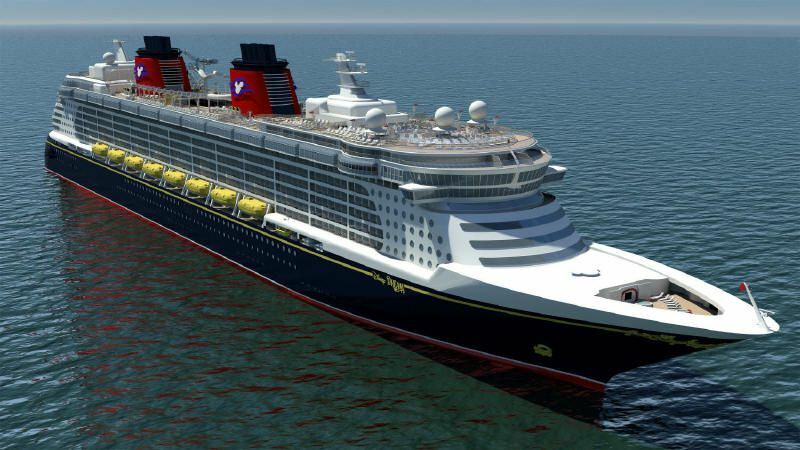 Read about the many cabin options, at this Disney Dream Staterooms Fact Sheet. The District, on Deck 4 of the Disney Dream, is a zone for ages 18 and up, with a piano lounge, several bars including the Skyline bar with changing views of famous city skylines; a pub with giant tv; a club for comedy acts, dancing, live performances. Also in The District: Senses Spa & Salon spans two decks, with 17 treatment rooms, steam bath, sauna, rain showers; and -- for that extra pampering-- two spa villas with treatment suite, and private verandah with whirlpool hot tub. What's Included in Your Disney Cruise Fare?